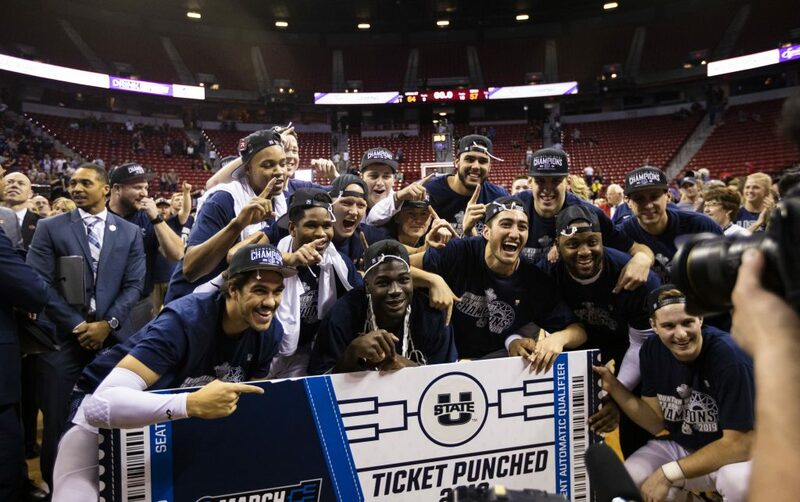 The Utah State Aggies play against the San Diego State Aztec Warriors in the Mountain West Championship game in Las Vegas, NV, on March 16. 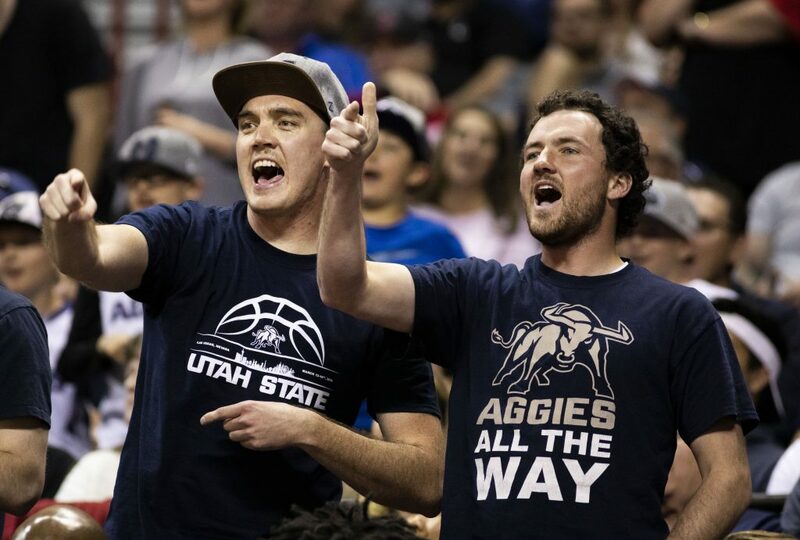 The Aggies won against the Aztecs, 64-57, and will be an automatic berth in the NCAA March Madness Tournament. 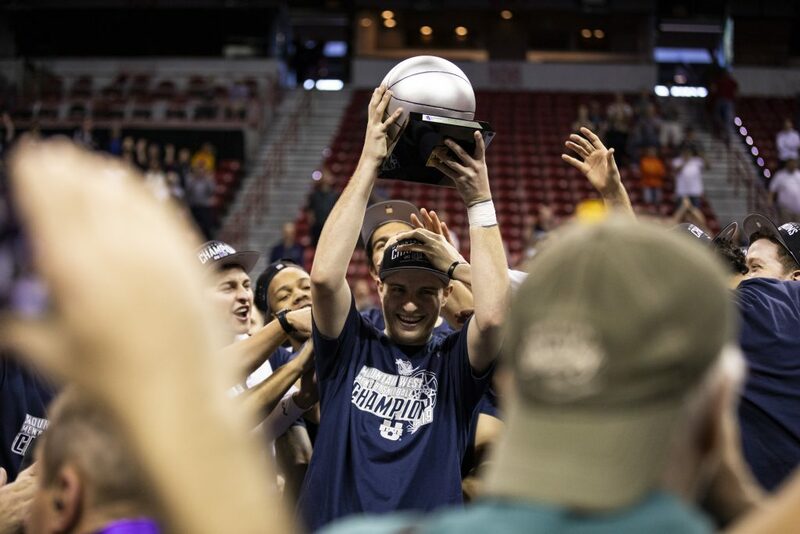 Utah State Aggies guard Sam Merrill (5) holds the Mountain West Championship trophy in Las Vegas, NV, on March 16. The Aggies won against the Aztecs, 64-57, and will be an automatic berth in the NCAA March Madness Tournament. 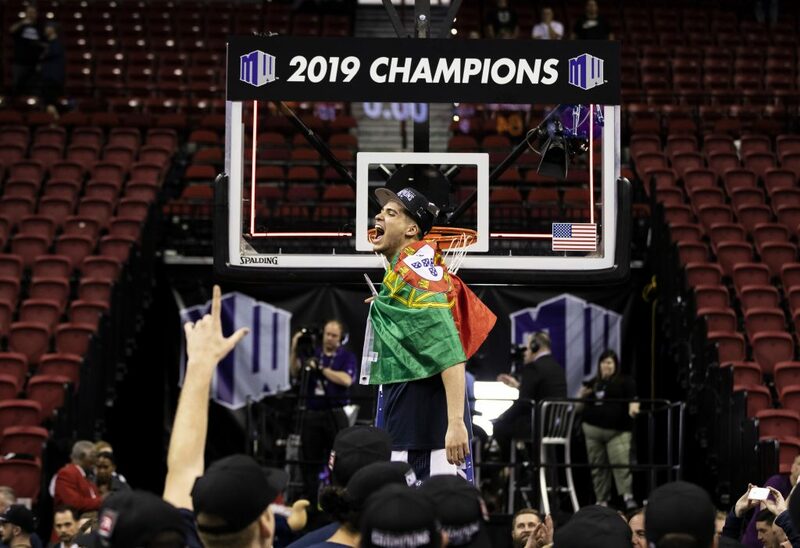 Utah State Aggies guard Abel Porter (15) and guard Diogo Brito (24) celebrate after winning against the San Diego State Aztec Warriors in the Mountain West Championship game in Las Vegas, NV, on March 16. The Aggies won against the Aztecs, 64-57, and will be an automatic berth in the NCAA March Madness Tournament. 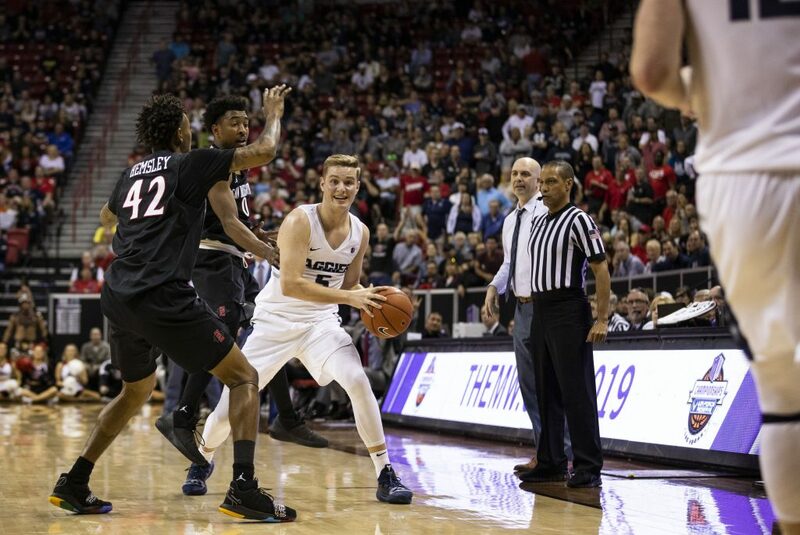 Utah State Aggies guard Sam Merrill (5) looks to pass the ball during the second half against the San Diego State Aztec Warriors in the Mountain West Championship game in Las Vegas, NV, on March 16. 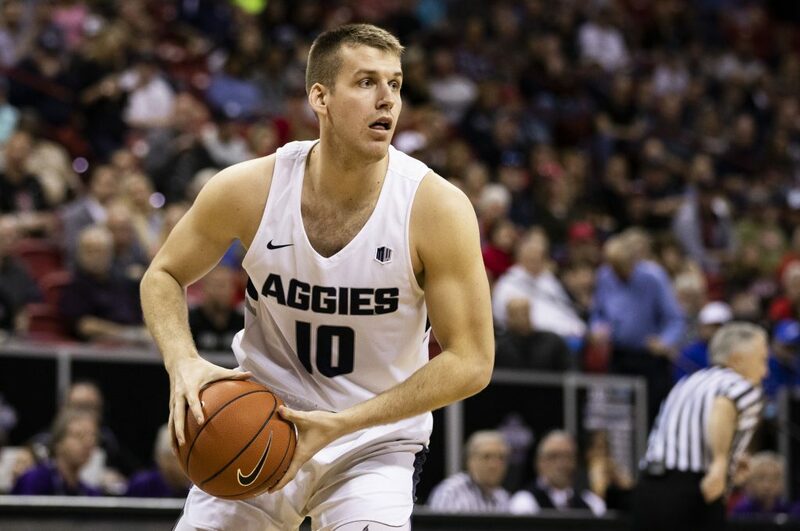 The Aggies won against the Aztecs, 64-57, and will be an automatic berth in the NCAA March Madness Tournament. 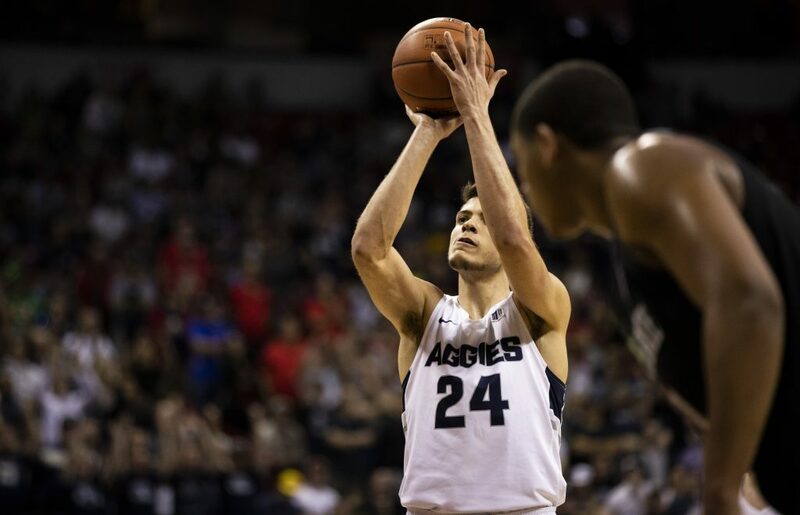 Utah State Aggies guard Diogo Brito (24) shoots a free throw during the second half against the San Diego State Aztec Warriors in the Mountain West Championship game in Las Vegas, NV, on March 16. 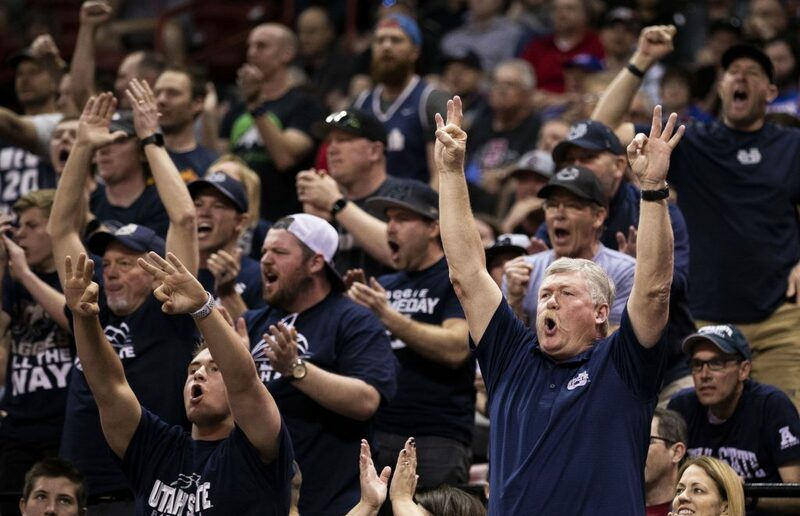 The Aggies won against the Aztecs, 64-57, and will be an automatic berth in the NCAA March Madness Tournament. 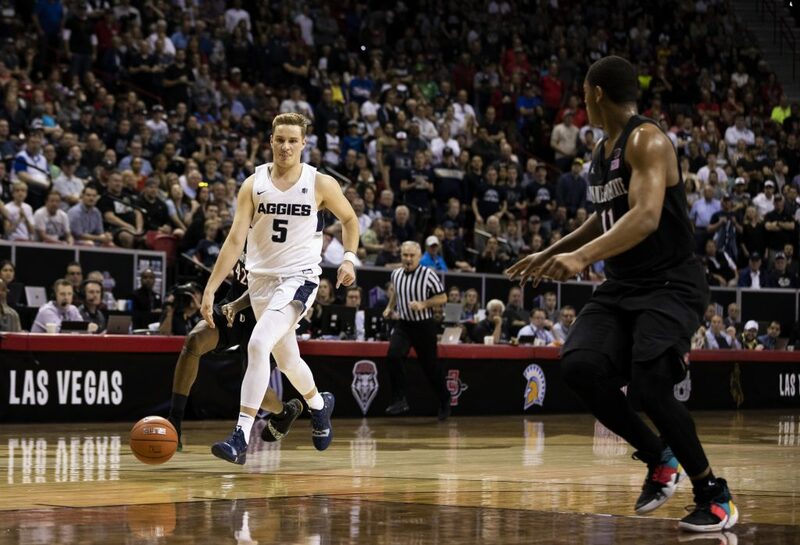 Utah State Aggies guard Sam Merrill (5) dribbles during the second half against the San Diego State Aztec Warriors in the Mountain West Championship game in Las Vegas, NV, on March 16. 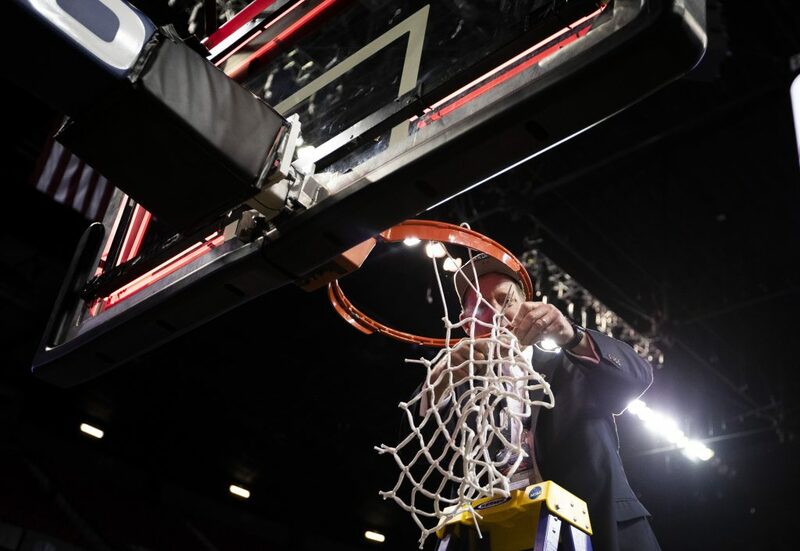 The Aggies won against the Aztecs, 64-57, and will be an automatic berth in the NCAA March Madness Tournament. 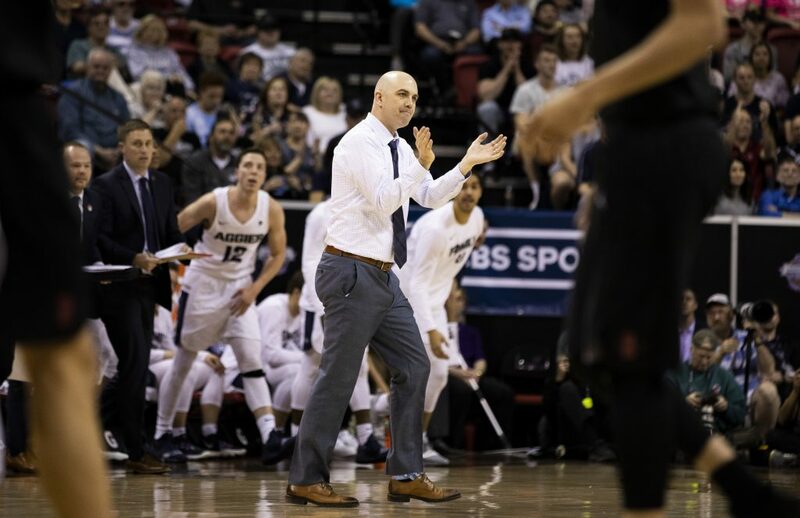 Utah State Aggies head coach Craig Smith reacts to a play during the second half against the San Diego State Aztec Warriors in the Mountain West Championship game in Las Vegas, NV, on March 16. 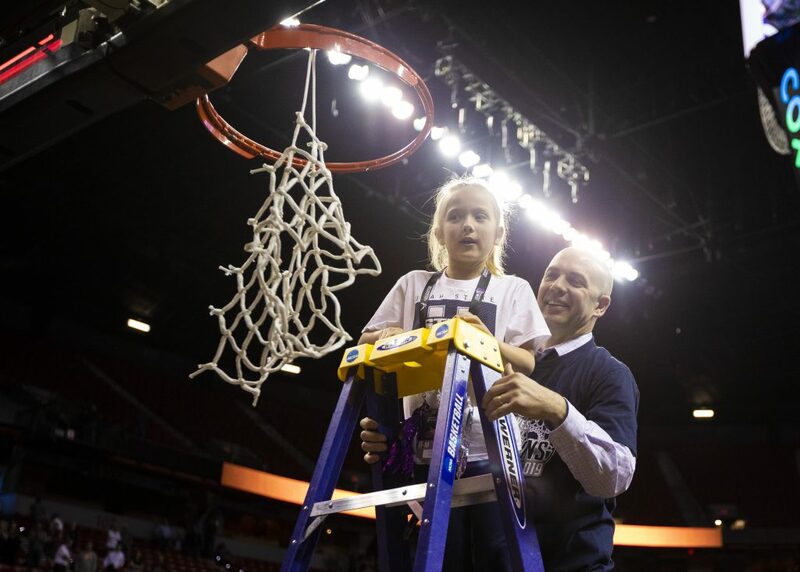 The Aggies won against the Aztecs, 64-57, and will be an automatic berth in the NCAA March Madness Tournament. Utah State Aggies forward Justin Bean (12) looks to rebound against the San Diego State Aztec Warriors in the Mountain West Championship game in Las Vegas, NV, on March 16. 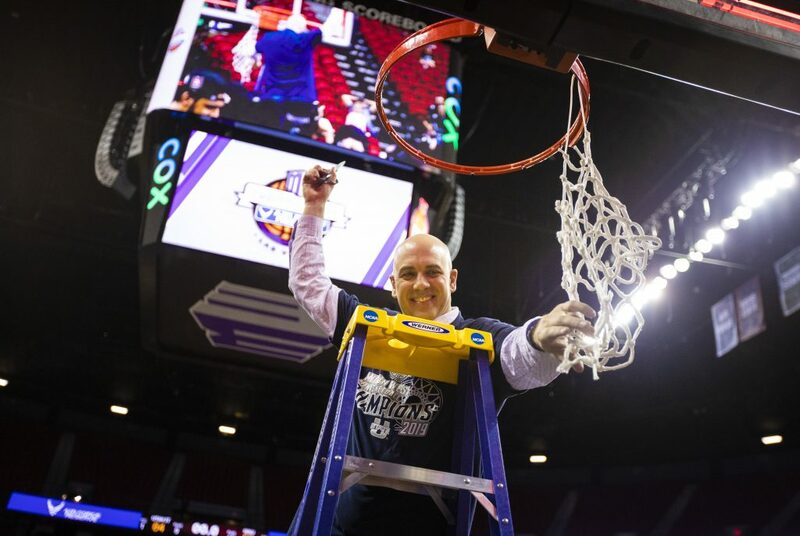 The Aggies won against the Aztecs, 64-57, and will be an automatic berth in the NCAA March Madness Tournament. Utah State Aggies center Neemias Queta (23) looks to rebound against the San Diego State Aztec Warriors in the Mountain West Championship game in Las Vegas, NV, on March 16. 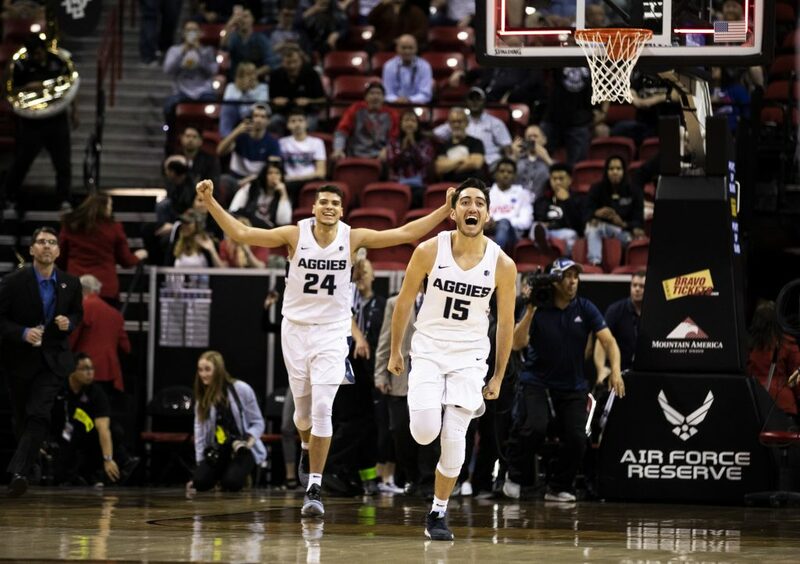 The Aggies won against the Aztecs, 64-57, and will be an automatic berth in the NCAA March Madness Tournament. 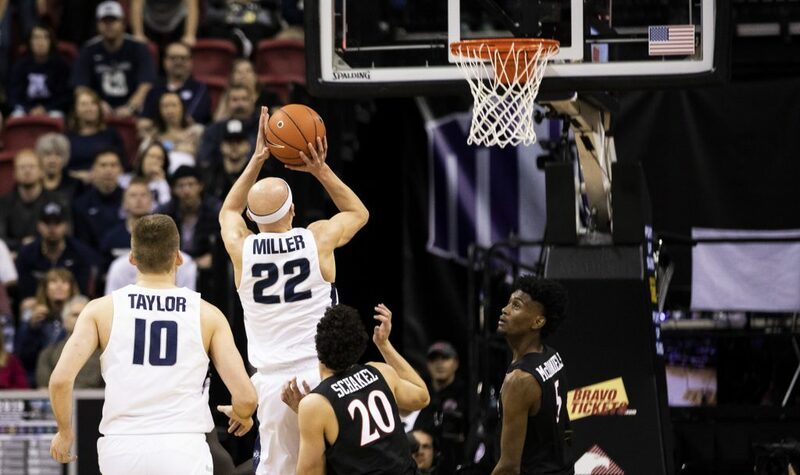 Utah State Aggies guard Brock Miller (22) looks to shoot a basket against the San Diego State Aztec Warriors in the Mountain West Championship game in Las Vegas, NV, on March 16. 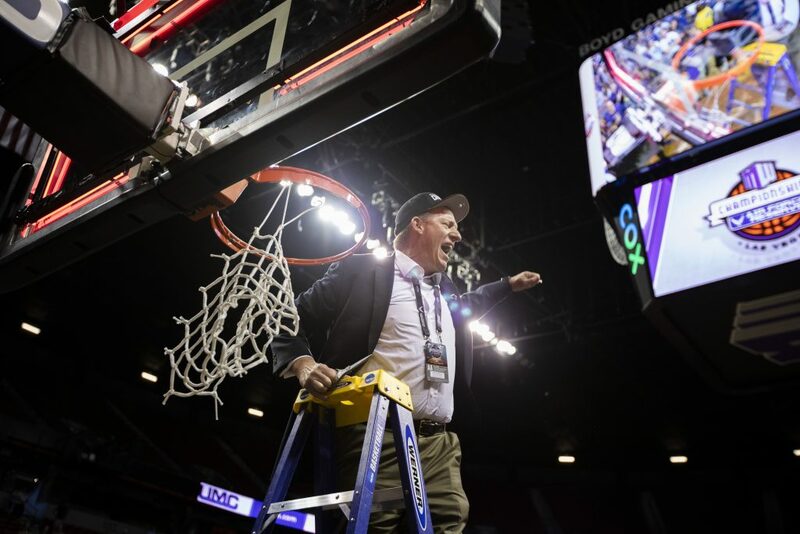 The Aggies won against the Aztecs, 64-57, and will be an automatic berth in the NCAA March Madness Tournament. 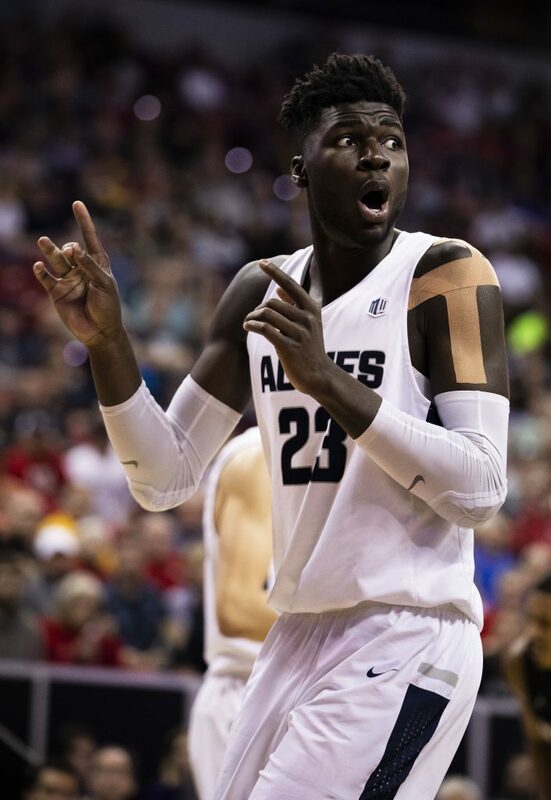 Utah State Aggies center Neemias Queta (23) reacts to a play during the second half against the San Diego State Aztec Warriors in the Mountain West Championship game in Las Vegas, NV, on March 16. 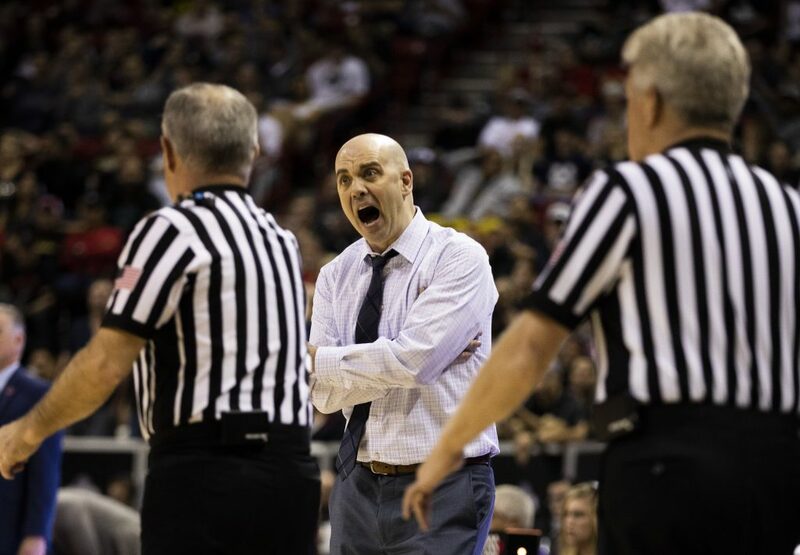 The Aggies won against the Aztecs, 64-57, and will be an automatic berth in the NCAA March Madness Tournament. 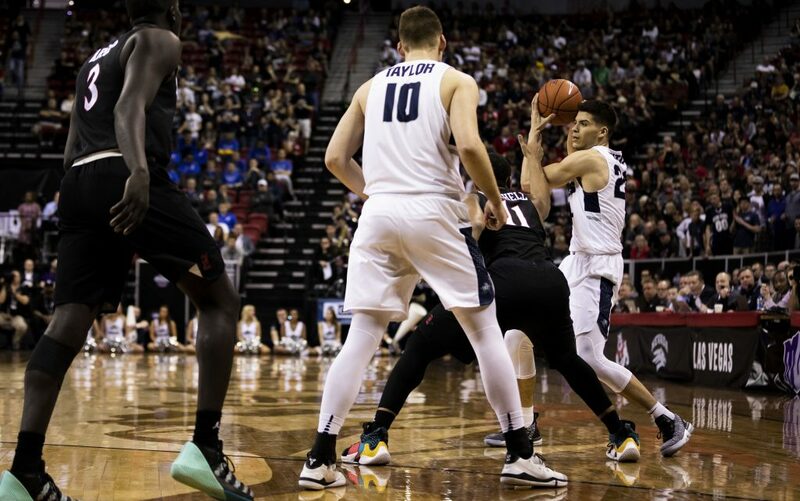 Utah State Aggies forward Quinn Taylor (10) holds the ball during play against the San Diego State Aztec Warriors in the Mountain West Championship game in Las Vegas, NV, on March 16. 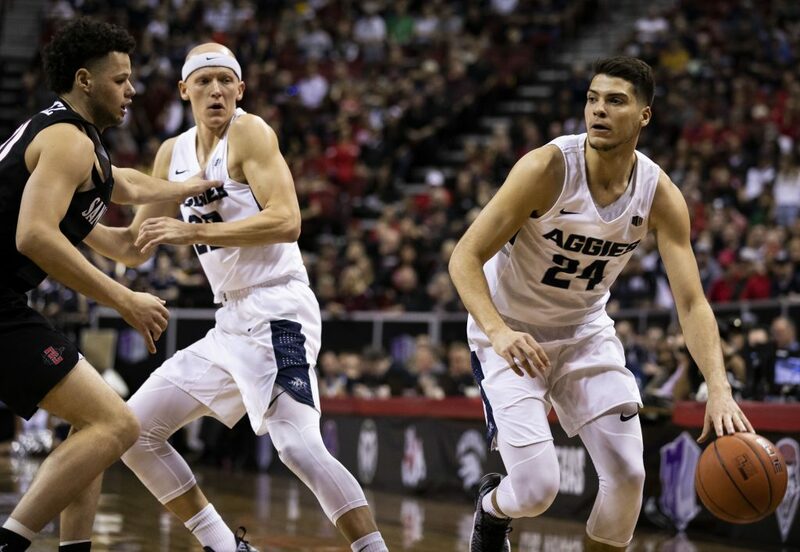 The Aggies won against the Aztecs, 64-57, and will be an automatic berth in the NCAA March Madness Tournament. 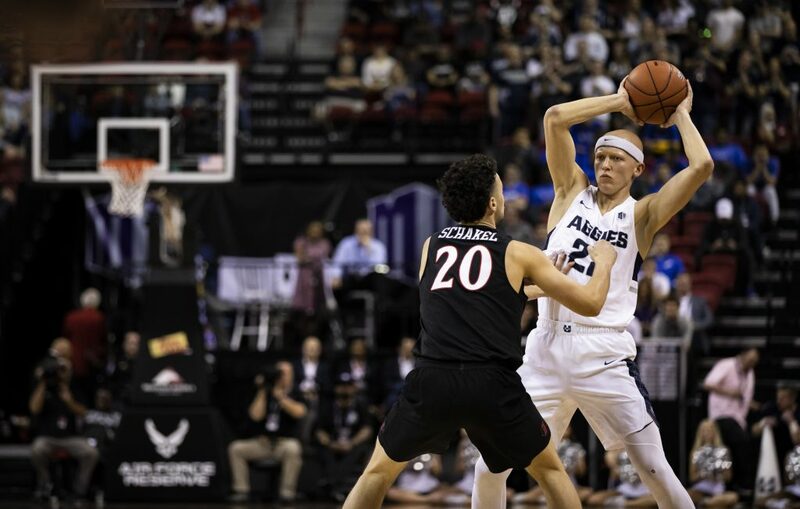 Utah State Aggies guard Brock Miller (22) drives to the basket during the first half against the San Diego State Aztec Warriors in the Mountain West Championship game in Las Vegas, NV, on March 16. 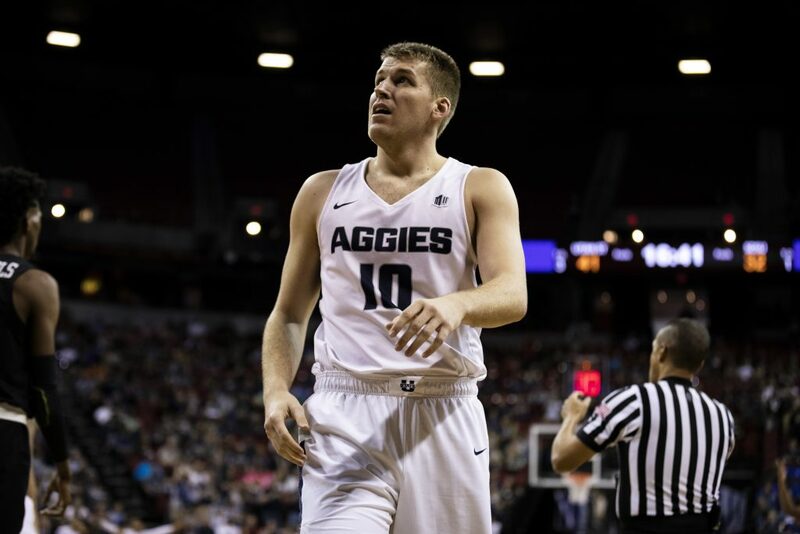 The Aggies won against the Aztecs, 64-57, and will be an automatic berth in the NCAA March Madness Tournament. 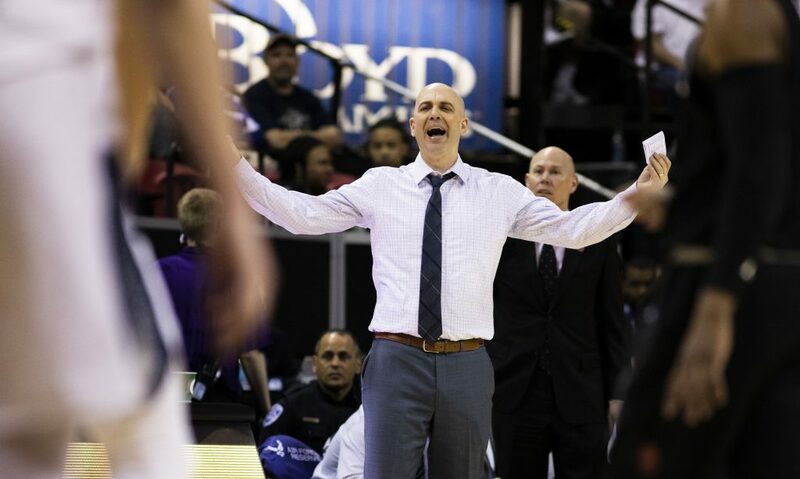 Utah State Aggies head coach Craig Smith reacts to a play during play against the San Diego State Aztec Warriors in the Mountain West Championship game in Las Vegas, NV, on March 16. 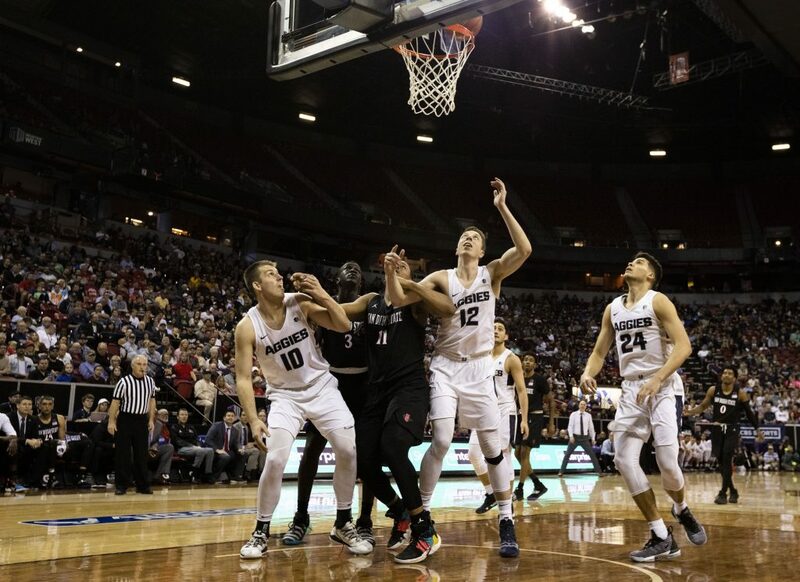 The Aggies won against the Aztecs, 64-57, and will be an automatic berth in the NCAA March Madness Tournament. 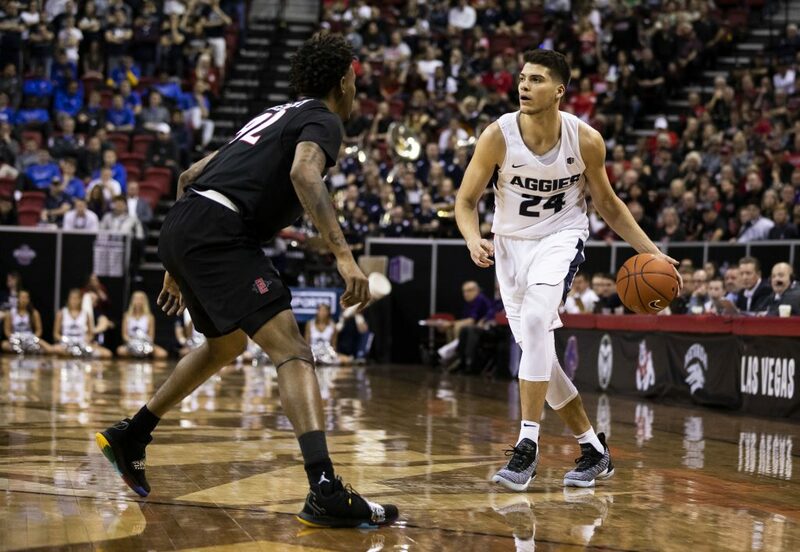 Utah State Aggies guard Diogo Brito (24) dribbles the ball against the San Diego State Aztec Warriors in the Mountain West Championship game in Las Vegas, NV, on March 16. 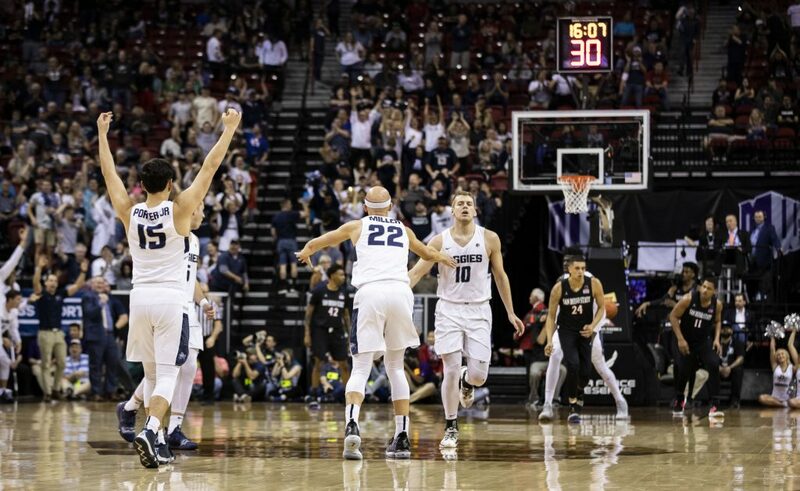 The Aggies won against the Aztecs, 64-57, and will be an automatic berth in the NCAA March Madness Tournament. 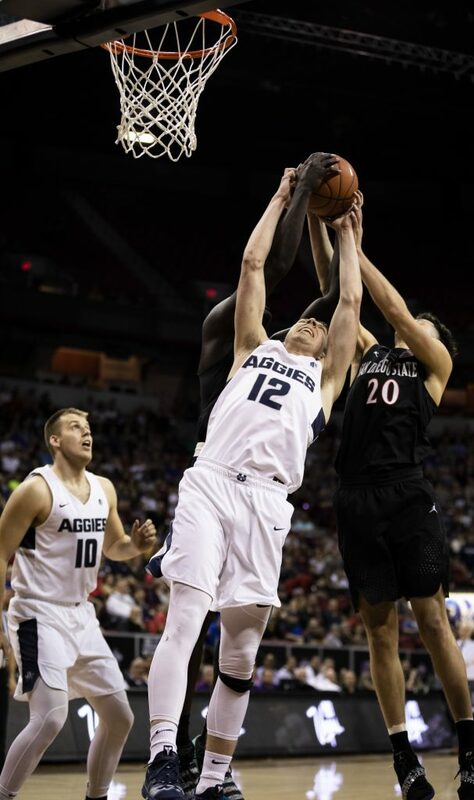 Utah State Aggies forward Justin Bean (12) attempts to rebound against the San Diego State Aztec Warriors in the Mountain West Championship game in Las Vegas, NV, on March 16. The Aggies won against the Aztecs, 64-57, and will be an automatic berth in the NCAA March Madness Tournament. 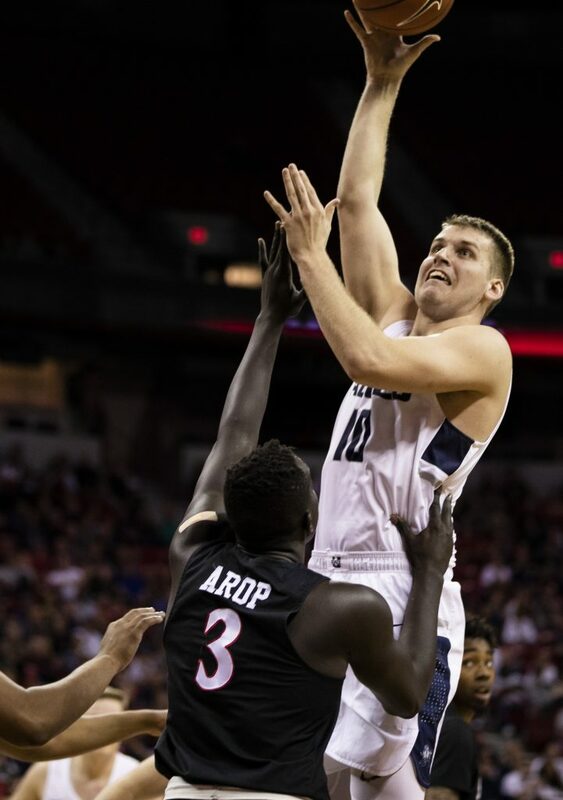 Utah State Aggies forward Quinn Taylor (10) attempts to shoot a basket against the San Diego State Aztec Warriors in the Mountain West Championship game in Las Vegas, NV, on March 16. The Aggies won against the Aztecs, 64-57, and will be an automatic berth in the NCAA March Madness Tournament. 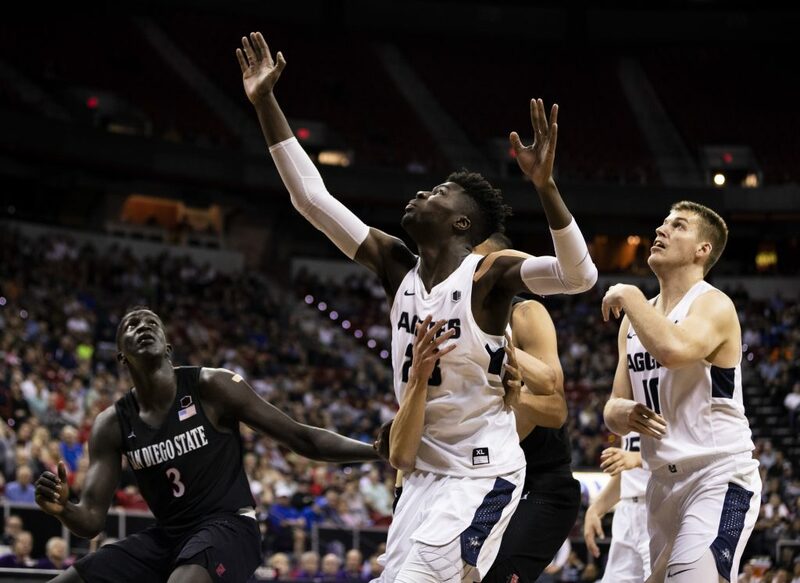 Utah State Aggies guard Abel Porter (15) passes the ball during play against the San Diego State Aztec Warriors in the Mountain West Championship game in Las Vegas, NV, on March 16. 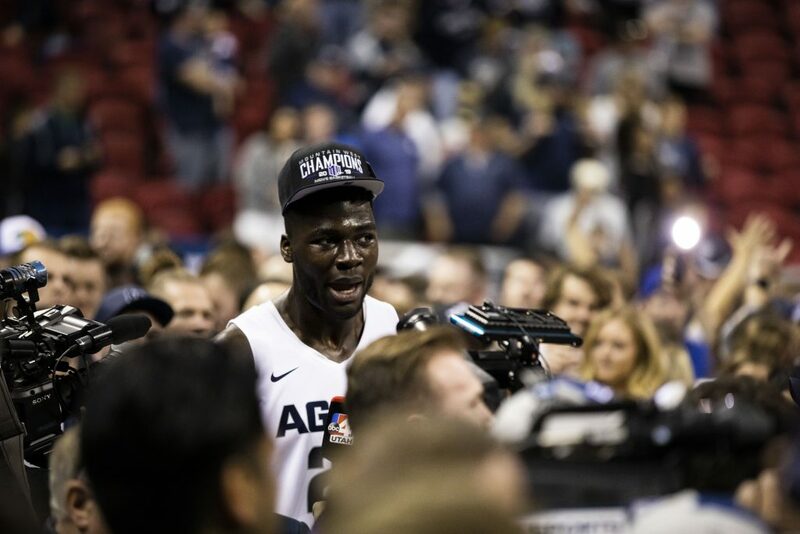 The Aggies won against the Aztecs, 64-57, and will be an automatic berth in the NCAA March Madness Tournament. 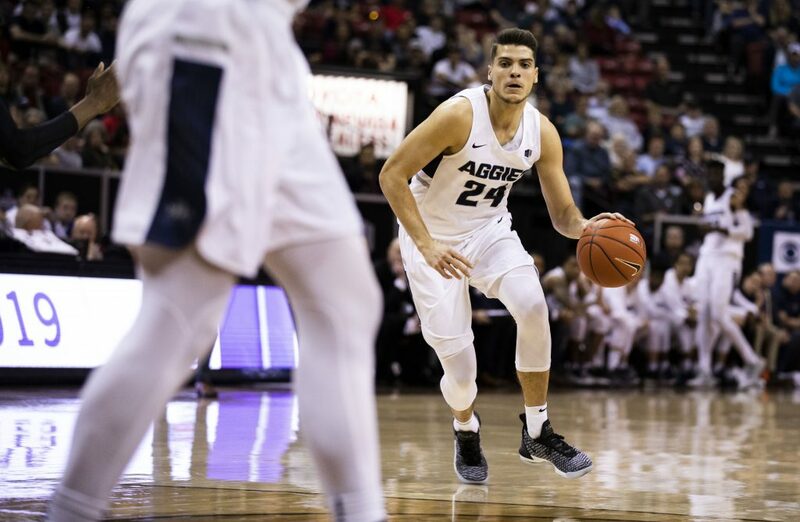 Utah State Aggies guard Diogo Brito (24) dribbles the ball during the first half against the San Diego State Aztec Warriors in the Mountain West Championship game in Las Vegas, NV, on March 16. The Aggies won against the Aztecs, 64-57, and will be an automatic berth in the NCAA March Madness Tournament. 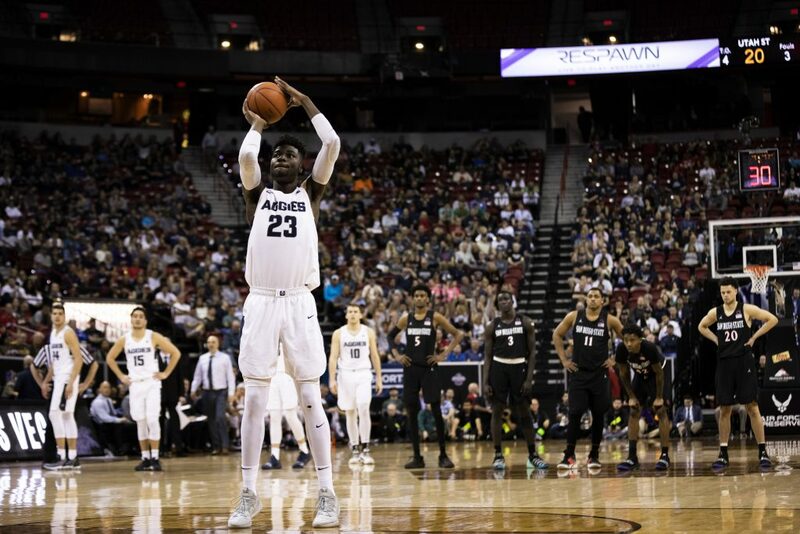 Utah State Aggies center Neemias Queta (23) shoots a free throw during the first half against the San Diego State Aztec Warriors in the Mountain West Championship game in Las Vegas, NV, on March 16. The Aggies won against the Aztecs, 64-57, and will be an automatic berth in the NCAA March Madness Tournament. 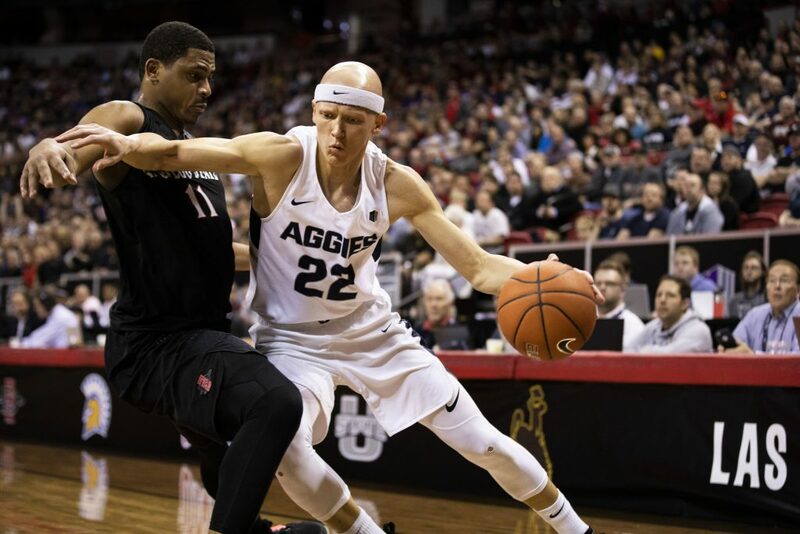 Utah State Aggies guard Brock Miller (22) looks to pass the ball against the San Diego State Aztec Warriors in the Mountain West Championship game in Las Vegas, NV, on March 16. The Aggies won against the Aztecs, 64-57, and will be an automatic berth in the NCAA March Madness Tournament. 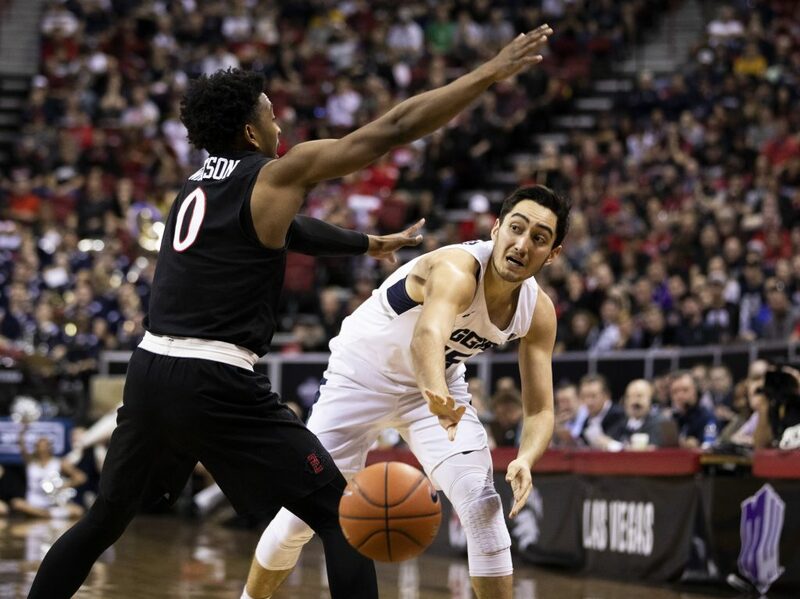 Utah State Aggies guard Diogo Brito (24) looks to pass the ball during the first half against the San Diego State Aztec Warriors in the Mountain West Championship game in Las Vegas, NV, on March 16. The Aggies won against the Aztecs, 64-57, and will be an automatic berth in the NCAA March Madness Tournament. 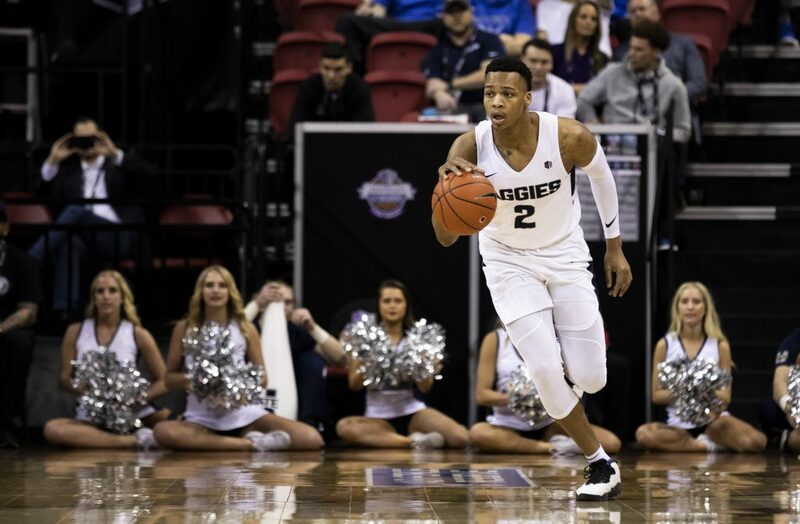 Utah State Aggies guard Dwanye Brown Jr. (2) dribbles down court during the first half against the San Diego State Aztec Warriors in the Mountain West Championship game in Las Vegas, NV, on March 16. The Aggies won against the Aztecs, 64-57, and will be an automatic berth in the NCAA March Madness Tournament. 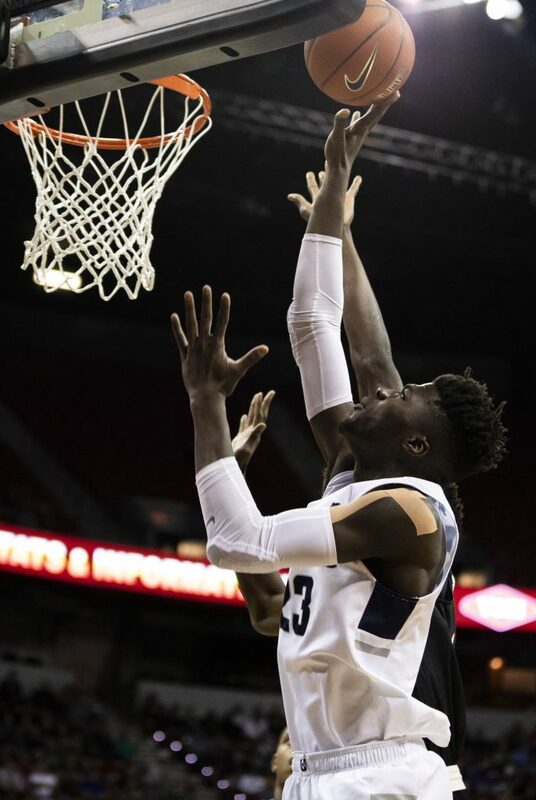 Utah State Aggies center Neemias Queta (23) shoots the ball during the first half against the San Diego State Aztec Warriors in the Mountain West Championship game in Las Vegas, NV, on March 16. The Aggies won against the Aztecs, 64-57, and will be an automatic berth in the NCAA March Madness Tournament. 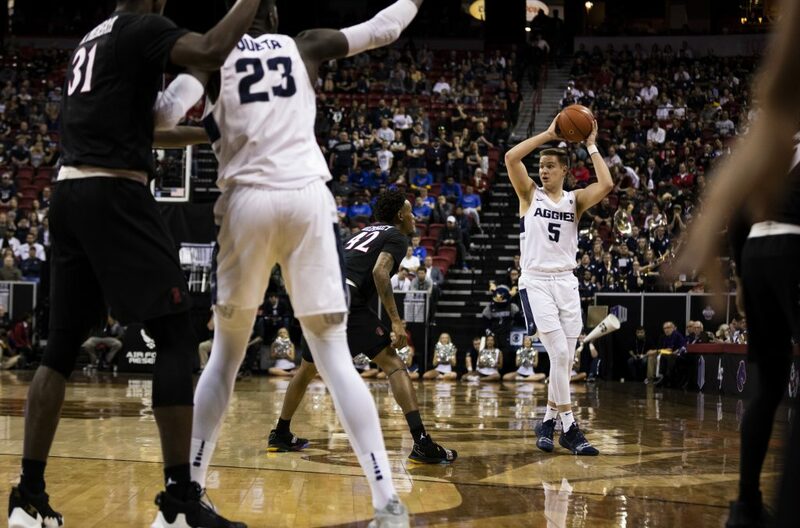 Utah State Aggies guard Sam Merrill (5) looks to pass the ball against the San Diego State Aztec Warriors in the Mountain West Championship game in Las Vegas, NV, on March 16. 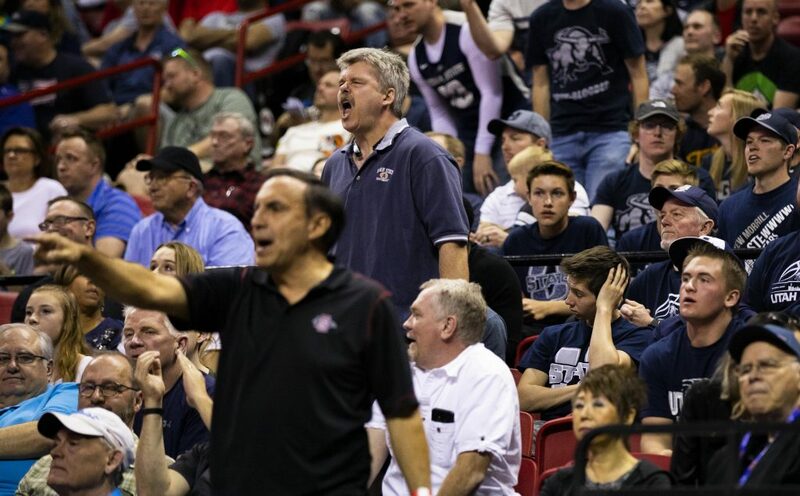 The Aggies won against the Aztecs, 64-57, and will be an automatic berth in the NCAA March Madness Tournament.